At their first state dinner on Tuesday night, United States President Barack Obama and his wife Michelle infused the glittering gala with their distinctive touch. 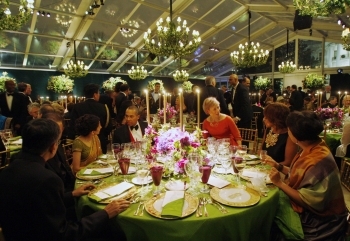 The guests at the state dinner included Louisiana Governor Bobby Jindal and his wife Supriya, director M Night Shayamalan, film-maker Steven Spielberg, New York Mayor Michael Bloomberg, former Secretary of State Colin Powell, Nobel Prize winning economist Amartya Sen and Industrialist Mukesh Ambani. 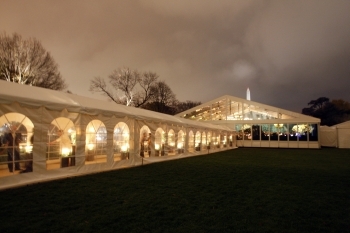 According to the New York Times, they hired a new florist, Laura Dowling, to deck up the tented outdoor dining room in the South Lawns of the White House with locally grown, sustainable harvested magnolia branches and ivy. They selected a guest chef, Marcus Samuelsson of Aquavit in New York, an American citizen who was born in Ethiopia, reared in Sweden and cooks up melting pots of flavors and cuisines. They invited local students to witness the arrival of Prime Minister Manmohan Singh and his wife Gursharan Kaur, and presented a melange of musical entertainment, including the National Symphony Orchestra; singer and actress Jennifer Hudson; jazz musician Kurt Elling and composer A R Rahman. The menu was vegetarian and included a mix of Indian and American favourites, including some African-American standards. Collard greens and curried prawns, chickpeas and okra, nan and cornbread were served to the 320 guests, including some well-known Republicans and prominent Indian-Americans -- who started off with arugula from the White House garden and finished up with pumpkin pie tart. The paper quoted Vishakha N Desai, a dinner guest and the Indian-born president of the Asia Society, as saying that the Obamas wanted to set a different tone, celebrating not just his African-American heritage, but also the cultural diversity of America. President Obama, according to the NYT, greeted his guests in Hindi and hailed the contributions of Mahatma Gandhi and Reverend Martin Luther King Junior, saying such 'giants are the reason why both of us can stand here tonight'. Dr Singh responded, "Your journey to the White House has captured the imaginations of millions and millions of Indians." 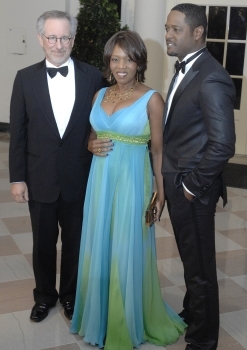 The evening was a potent mix of politics, diplomacy and glamour, with the administration's favoured donors mingling with lawmakers from the Congress, cabinet secretaries, Indian dignitaries and Hollywood celebrities decked out in tuxedos and designer dresses. Historically, President Ulysses S Grant hosted the first White House dinner in 1874 for King David Kalakaua of Hawaii. President George W Bush held only six state dinners, while President Bill Clinton hosted more than 20, the NYT reports. Michelle Obama made a splash by showcasing deep, rich colours -- apple green for the tablecloths and varying shades of plum, purple and fuchsia in the hydrangea, roses and sweet peas in the center pieces. There was White House honey and sage from the garden and a menu that gave vegetables and beans -- including eggplants and lentils -- top billing. Dozens of schoolchildren were invited to participate in the day's events and savoured the chance to see the White House up close. 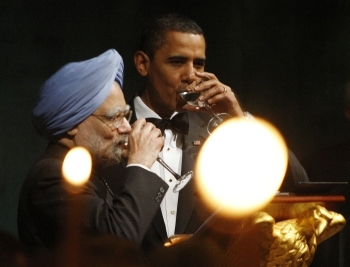 State dinner for PM Singh: What's cooking?